Four years ago, Japan looked like it had finally moved toward a truly competitive party system after years of virtual one-party rule by the dominant Liberal Democratic Party of Japan (LDP, or 自由民主党, Jiyū-Minshutō). But after a landslide LDP victory last December ushered former prime minister Shinzō Abe (安倍 晋三) back into office, the LDP once again controls over two-thirds of the seats in the House of Representatives, the lower house of Japan’s Diet (国会). After Sunday’s House of Councillors elections, the LDP is overwhelmingly expected to re-take control of the upper house from the Democratic Party of Japan (DPJ, or 民主党, Minshutō), giving Abe a much easier time in implementing policy, likely for the next three years. The LDP might well even find that it controls over two-thirds of the upper house as well. Abe (pictured above) swept into power, nearly decimating the DPJ that had governed Japan from 2009 through last December, on a platform of massive monetary and fiscal intervention to boost the Japanese economy in what’s become known as ‘Abenomics.’ With approval ratings over 70%, Abe seems to have succeeded, at least in the short-term, in boosting confidence in his party and his ability to stimulate Japan’s economy after over two decades of deflation and low growth. 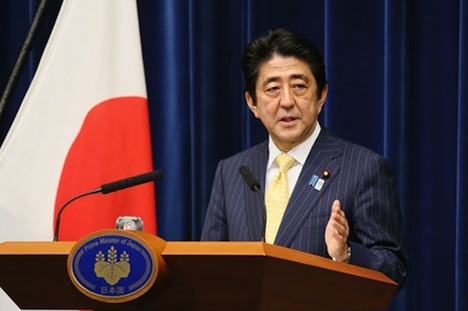 Critics fear, however, that if Abe controls a two-thirds majority in the House of Councillors as well, he’ll be in a position to push through amendments to Japan’s constitution, potentially paving the way for a controversial push for a more militarized Japan in the future. Things are looking decidedly bleak for the Democratic Party. Although only half of the seats in the House of Councillors are up for reelection, the DPJ’s grasp on power there is extremely narrow — it holds 106 seats to 83 seats for the LDP and 19 seats for the LDP’s more conservative, Buddhist ally, New Kōmeitō (公明党, Shin Kōmeitō). Moreover, the Democratic Party would have been playing defense in this year’s elections regardless of its dwindling popularity — it will be defending 44 seats and other opposition parties will be defending 26 seats, while the LDP will be defending just 34 seats and New Kōmeitō will be defending just 10. None of Japan’s other third parties seem capable of breaking through either. The one party that seemed to have some momentum in December’s elections was the Japan Restoration Party (日本維新の会, Nippon Ishin no Kai), a merger between Osaka mayor Tōru Hashimoto (橋下徹) and right-wing, nationalist former Tokyo governor Shintaro Ishihara (石原慎太郎). In particular, it was the youthful Hashimoto’s charisma that seemed to propel the party to win 54 seats in the House of Representatives last December, giving it nearly as many seats as the DPJ (which fell back to just 57 seats). But the party’s fortunes have collapsed over Hashimoto’s comments indicating that U.S. soldiers in Okinawa should be allowed to use prostitutes and that ‘comfort women’ — civilians that Japanese soldiers forced into sexual slavery during World War II — were a necessary evil at the time. Polls indicate that virtually no party can stop the LDP’s projected sweep — one representative poll earlier this week indicated that the LDP would win 43% and New Kōmeitō would win 8%, while the Democratic Party, the Japan Restoration Party and two other third parties, the liberal reformist Your Party and the Japanese Communist Party would each win just 6%. That result would essentially thrust Japan back to its norm of one-party rule, leaving the Democratic Party potentially permanently shattered and permitting Abe to push forward with a pro-nuclear energy policy (still controversial after the 2011 Fukushima meltdown) and otherwise implementing a more nationalist Japan.